The Secondary Education Board of Assam or SEBA will announce the Assam Board 10th Result 2019. The Assam Board Class 10 result 2019 will be declared by the last week of May. Students will be able to finally check the outcome of the hard work that they have put in for a year in the form of Assam Board Class 10 result 2019. 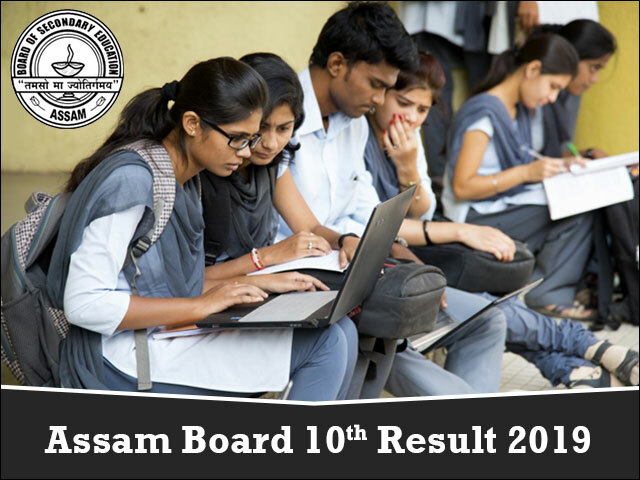 The authorities will also publish the Assam Board 10th Result 2019 online on the official website so that students can check their result conveniently. Alternatively, students will also be able to check their Assam Board Class 10 result 2019 on this page. Once formally announced, live links to Assam Board 10th result 2019 will be made available here. So, bookmark this page and stay updated on all the relevant information about Assam Board Class 10 result 2019. Knowing the SEBA result declaration date of the previous year will give an idea about Assam Board Class 10 2019 result declaration date. Last year, the exam was completed in the month of March – April. SEBA declared the Assam Board 10th result 2019 on 25th May. It is anticipated that the trend for the declaration of Assam 10th Result 2019 will be the same as that of the previous year. The board has decided to follow this trend for the upcoming years as well. As per SEBA or Secondary Education Board of Assam, the result declaration of 10th exam under Assam is expected in the last week of May, same year. Experts suggest that the Assam Board Class 10 result 2019 will be released as per the annual academic calendar so as to apply to higher courses f study without any delay. You can also find all the latest information and updates about Assam High School Leaving Certificate Exam 2019 here on this page. We understand the anxiety that the students waiting for Assam 10th Class Results are suffering from. To help them, we would be offering regular news and updates about Assam HSLC Result 2019 here on this page. Our team is constantly in touch with the SEBA officials and is also scouting all the online resources. All the latest news and updates about Assam 10th Result 2019 will be shared with you first on this page. The students can also subscribe to email alerts and updates service through which these critical updates would be directly shared in your inbox. For this, you can submit your email id, mobile number and other important details in the form provided at the top of this page. The aspiring students will plan their career path as per Assam 10th result 2019. You must have worked really hard during your exam days to secure good marks. Naturally, your expectation is high with regards to the upcoming Assam 10th Result 2019. So, before we move ahead with current year's information, let's get a quick glance at last year statistics. Post the official declaration of Assam Board Class 10 result 2019, it will also be available on the official website of the board i.e. sebaonline.org. Additionally, Assam HSLC result 2019 can be accessed by the students directly from this page. The Assam 10th Results for HSLC students will be available at assam10.jagranjosh.com. The students will be able to check their Assam Board Class 10 Result 2019 online by providing basic information like hall ticket number, date of birth and other such details on the website. The Assam Board result 2019 is a significant milestone for the students awaiting the same. Students must note that Assam Board 2019 result will be a major milestone for admission to higher courses of study. How to Check Assam HSLC Result 2019? Taking the digital initiative of the government further, the SEBA will be declaring the Assam 10th Result 2019 online on their official website i.e. sebaonline.org. However, due to heavy rush, the website might suffer from some technical glitches that might cause a delay in checking Assam HSLC Result. You need to follow step by step procedure mentioned below to get your Assam HSLC result online. Students, after checking the Assam Board Class 10 result 2019 online, must save an offline copy of the scorecard in a PDF format for future reference. We advise the visiting students to either save a soft copy of the mark sheet or take a hard copy of the same for future reference. It is worth mentioning here that the printed mark sheet will not be considered as an official document for admission purposes in higher education institutions. The students should, therefore, get their Assam Board Result Certificate issued by SEBA from their respective schools. Assam Board Class 10 2019 result may be joy for some while for some students it may bring about disappointment. The students who are not satisfied with their score and believe that their answer scripts have not been properly evaluated will also have an option of re-evaluation and re-checking their answer sheets. The students can take benefit of this particular provision by paying a nominal fee as directed by the concerned Board and submitting an application through their respective institutions. The students who do not manage to do well in the Assam Board 10th result 2019 despite their best efforts can appear for Assam Board Compartmental/Improvement Exam. This exam provides the candidates with a second chance to improve their scores in a single or multiple subject(s). Students can apply for appearing in the supplementary/improvement exam of Assam board by filling in the application form that will be made available on the official website of Assam HSLC 2019. The Assam Board Compartmental examination 2019 will be held in the month of June. Popularly known as SEBA, the Secondary Education Board of Assam is the primary custodian of high school level education in the state. The SEBA looks after the development, promotion, monitoring and expansion of high school education in the state for students' up to class 10. The board also organises the annual Assam High School Leaving Certificate (HSLC) Exam every year in the month of February – March. According to the dates announced by the board, the class 10 examination will start from February 14, 2019 and will continue till March 2, 2019. The Assam Board HSLC Compartment Result 2018 has been declared on the official website of the board that is sebaonline.org. The Secondary Education Board of Assam (SEBA) has announced the Assam Board HSLC Result 2018 today. The declaration of HSLC SEBA Result 2018 has sealed the fate of more than 2 Lakh students. After the formal declaration of the SEBA Result 2018, the scorecards will be available on the official website of the Assam Board i.e. sebaonline.org.